Back during the last solar maximum, around September, October, for few consecutive years I'd see this special kind of electric storm, here in Europe. No sound at all, and extremely high frequency of cloud-to-could lightning, 1 to few per second. The effect was such that you could read from the amount of light constantly emitted. Yes, all such storms I experienced were during the night. I saw only few such storms in my life. I didn't pay attention to the solar maximum 1988-1990, and I was too young for the 1978 maximum, so these storms I saw only in the 1999-2001 period. Can anyone tell me what was that? Does it have a name, or is it just a typical (rare?) electric storm? Since I believe those storms had something to do with the solar maximum, because I didn't see anything similar from 2001 to today, and I _do_ observe every storm I'm in, because I'm fascinated by them -- I am looking forward to the next maximum. Meanwhile, I'd like to learn about them as much as possible. Last edited by nick c on Tue Mar 29, 2011 8:38 am, edited 1 time in total. Re: A special case of electric storm? How are you observing the sun storms? Any special equipment or just a telescope with filters? substance wrote: How are you observing the sun storms? Any special equipment or just a telescope with filters? Would you be so kind, please, and actually read my post this time? Thank you. You describe electrical storms I've seen in Seattle from time to time... like you, I "observe" every storm I'm in, but unlike you, I've not been "smart" enough to try to correlate them with the solar cycle... we had an electrical strom just like that about a month ago, but the last one I saw was perhaps a decade back. In Seattle we don't get thunderstorms very many times a year, and they are sometimes comparable to the phenomenal storms of the midwest that I've had occasion to experience, complete with rumbling, ice pellets (we don't really get much true hail here), and a good downpour. These "electrical storms" however are truly remarkable, even spooky, and great fun to just stand and look up at all the cloud-cloud lightning, with no thunder, and hardly any rain. I was wondering during this last one what kind of sprite activity may be happening above? Well, my correlation with the solar maximum is one giant assumption based on the sole fact that I haven't seen a single storm like that since 8 or so years ago. If I happen to see them again in few years, I might say with more confidence that the correlation is really there. So far it only makes some kind of sense that the two are linked, because of the electrical nature of the sun which is not just a theory to me. Next time I'll try to make a video, they're truly remarkable. 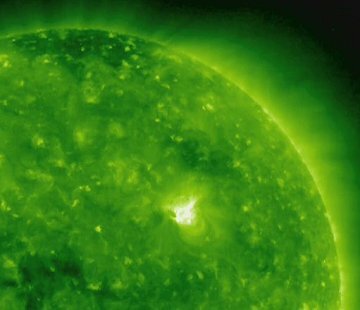 NASA recently wrote about portals opening between the sun and the earth and called them Flux Transfer Events. Could a sunspot simply be the sun rexperiencing a flux transfer event from the galactic core or other energy source outside the solar system? "In the Electric Sun model, as with any plasma discharge, tufting disappears wherever the flux of incoming electrons impinging onto a given area of the Sun's surface is not sufficiently strong to require the shielding produced by the plasma double layer. At any such location, the anode tufting collapses and we can see down to the actual anode surface of the Sun. Since there is no arc discharge occurring in these locations, they appear darker than the surrounding area and are termed 'sunspots'. "Of course, if a tremendous amount of energy were being produced in the Sun's interior, the spot should be brighter and hotter than the surrounding photosphere. The fact that sunspots are dark and cool strongly supports the contention that very little, if anything, is going on in the Sun's interior. The center of the spot is called its umbra. "Because there is no anode tufting where a spot is located, the voltage rise (region a to b in the energy plot above), which normally limits the local flow of positive ions leaving the anode surface, does not exist there. In sunspots, then, a large number of ions will flood outward toward the lower corona. Such a flow constitutes a large electrical current - and, as such, will produce a strong localized magnetic field near the sunspot." Thornhill wrote: ...What causes a sunspot? In the electrical model, the Sun receives electrical energy from interstellar space in the form of a glow discharge. Plasma experiments show that some energy will be stored in a donut shaped 'plasmoid' above the Sun's equator. This sometimes also gets referred to as a "plasma torus" or "plasma donut" or some other similar term. Shouldn't be surprising, since Kristian Birkeland did experiments in the lab back in the early 1900's that showed may instances of equatorial plasma toruses around his terella under particular conditions. It may be that sunspots are simply touchdown points from the equatorial torus to the surface of the sun, as Thornhill goes on to suggest. This model can explain why sunspots of the same magnetic polarity are strangely attracted toward each other instead of being repelled. (Try pushing together two similar poles of two magnets). The sunspots are receiving electric current flowing in parallel rotating streams, which results in their being mutually attracted over long distances and repelled at short distances. That, in turn, explains why sunspots often seem to maintain their identity even if they come close enough to merge. There is also other evidence that suggests the presence of electric currents aligned with the magnetic field in a sunspot. Granulation has been observed in the umbra, or dark centers of sunspots, by overexposing sunspot images. The umbral granules are more closely packed than photospheric granules. That is to be expected on this model because the current in the large charge sheath vortex forming the sunspot is being delivered to denser atmosphere at lower depths. Umbral granules should not be there if sunspots are formed by magnetic throttling of the convection process. . The Nature article also mentions 'fainter structures in the umbra' These features are associated with the inward migration of a bright dot followed by repeated brightening and fading on a timescale of minutes. This suggests that a larger fraction of umbrae than observed so far could have faint or small-scale filamentary structure.' The nature of a charge sheath vortex is to tend to compress material inside and lengthen the tube in both directions. Since it is also acting as a conduit for electrical energy, it seems that the moving bright dots are small-scale filamentary lightning emanating from the lower ends of the penumbral filament vortex. "IT IS midnight on 22 September 2012 and the skies above Manhattan are filled with a flickering curtain of colourful light. Few New Yorkers have seen the aurora this far south but their fascination is short-lived. Within a few seconds, electric bulbs dim and flicker, then become unusually bright for a fleeting moment. Then all the lights in the state go out. Within 90 seconds, the entire eastern half of the US is without power. "A year later and millions of Americans are dead and the nation's infrastructure lies in tatters. The World Bank declares America a developing nation. Europe, Scandinavia, China and Japan are also struggling to recover from the same fateful event - a violent storm, 150 million kilometres away on the surface of the sun. "It sounds ridiculous. Surely the sun couldn't create so profound a disaster on Earth. Yet an extraordinary report funded by NASA and issued by the US National Academy of Sciences (NAS) in January this year claims it could do just that." Download the actual report itself directly from The National Academies Press at http://www.nap.edu/catalog.php?record_id=12507. Free 13.4mb pdf download (just have to fill out a short and simple, free sign-up form). Hmm - so, is it just serendipitous that Nick Cage's production company, Saturn Films, releases the movie, "Knowing?" I know a certain wascally wabbit who might say, "Eh - what's up, doc?" Also found in M. E. J. Newman's paper Power laws, Pareto distributions and Zipf's law at http://arxiv1.library.cornell.edu/abs/cond-mat/0412004v3, solar flares are "power law" distributed, thus implying a fractal / scalable mechanism. This is supporting evidence for plasma activity. "The bright region is an unassociated solar flare. When particles from the eruption reach Earth on the evening of August 3/4, they may trigger a brilliant auroral display known as the Northern Lights." Are any of simultaneous phenomenon "unassociated"? errrr, i was looking at the calendar which i had forgotten to change . .
ejection arrived last night, and today...anybody see anything, auroras, sparks, anything?..